When a stroke has affected you or someone you love, it is a life-altering experience that is filled with fear, doubts, and challenges. We are committed to assisting you in any way possible to improve the quality of life for you or your loved one. Through a variety of treatment methods, it is our mission to improve functioning, reduce pain, and enhance daily living. One of our promising alternatives includes Virtual Reality in Stroke Rehabilitation. Virtual Reality, otherwise referred to as VR, is a new approach in stroke rehabilitation that is gaining popularity. It is a treatment alternative that can be implemented at home as well as during rehabilitation appointments at our office. VR allows us to combine Virtual Reality and the latest in computer technology to assist our patients. Stroke victims have difficulty returning to normal life due to brain injuries that restrict their ability to move. If you or your loved one has suffered the damaging effects of a stroke, a combination of VR and physical therapy shows great promise in improving mobility once again. By engaging the brain and movement, VR has proven to be extremely effective. Through the use of CAREN, Computer Assisted Rehabilitation Environment, post stroke victims have experienced positive results, taking a step further on the road to recovery. Psychological, physical, and cognitive benefits are all a part of engaging in VR activities as patients engage in Virtual Reality experiences. 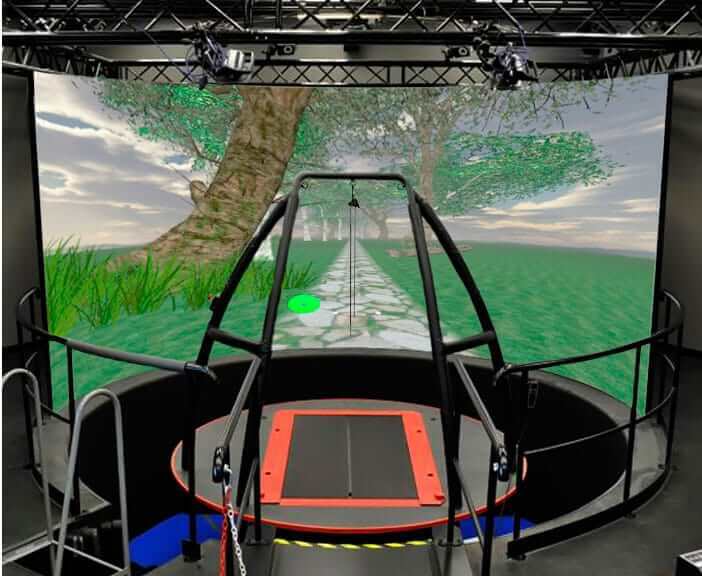 Research has found that VR and stroke rehabilitation has been effective in addressing motor deficits and shorten the recovery process for many patients, improving their motor functioning in ways that are not possible through physical therapy alone. At New York Dynamic Neuromuscular Rehabilitation, we recognize the need to provide a variety of therapeutic techniques in order to provide our patients with the best prospects for recovery. We are dedicated to forming a comprehensive plan for you or your loved one in order to address all areas of functioning in your life. From the physical, to emotional and cognitive needs, a combination approach can enhance the recovery process. Through VR technology, patients experience stimulation of neurons in the brain. They are able to perform virtual activities that do not actually put strain on their bodies or cause any pain, improving brain functioning in the process. VR is beneficial in developing cognitive functioning and improving perception. Virtual Reality is a groundbreaking approach that is still under development. While it is not the end all, be all in treatment, it does show great promise when combined with other techniques. We are committed to taking every avenue to help our patients have the best possible outcome through a combination of treatment methods. We will tailor a plan of action to suit you or your loved one. As pioneers who leave no stone unturned, VR is only one component of stroke rehabilitation that we use to engage our patients. We will use every possible approach. The statistic shows that there are about 15 million people affected by a stroke worldwide each year. About 5 million of those affected result in death and 5 million are left with a permanent disability. For those who survive, it is very difficult to return to a normal activity, such as controlling their movements and becoming independent again. 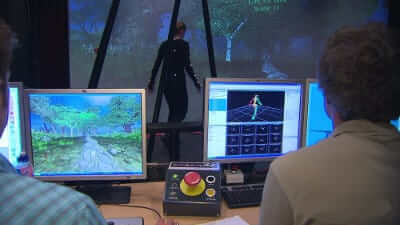 Researchers are using virtual reality and computer technology to improve stroke rehabilitation. This new revolutionary software can help identify different types of brain injuries, and help facilitate the most effective ways to treat the patient. Virtual reality (VR) has emerged as one of the most effective treatment approaches in stroke therapy rehabilitation. This method is beneficial because they provide the patient and physical therapist with the opportunity to practice activities that are not or cannot be achieved within the clinical environment. Additionally, virtual reality is often designed to be more engaging, more interesting and more enjoyable than traditional stroke rehabilitation, thereby encouraging patients to continue on a physical therapy regime versus patients who plateau and discontinue with stroke physical therapy. The use of virtual reality programs designed for rehabilitation is not yet routine practice in clinical settings. 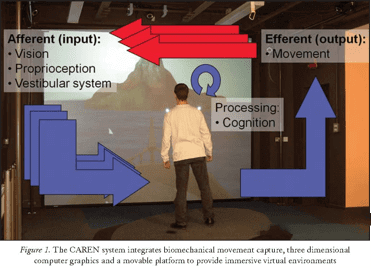 At DNR we have utilized CAREN (Computer Assisted Rehabilitation Environment) to treat patients post stroke and post brains injuries (TBI or CVA). However, the use of virtual-reality technology in the areas of rehabilitation and therapy continues to grow, with encouraging results being reported for applications that address human physical, cognitive, and psychological functioning. Virtual Reality is a very encouraging and effective treatment for patients post stroke. In turn combining VR and other physical therapy modalities patients can effectively speed up their treatment and recovery time. Furthermore, advances in stroke therapy is promptly showing significant improvement when combined with Virtual Reality. Roughly two-thirds of stroke survivors experience motor deficits, according to the American Stroke Association, and conventional rehabilitation can be a lengthy process. Virtual reality therapy is transforming the way to a future of efficient stroke rehabilitation. Virtual reality therapy for stroke victims has infinite possibly and potential. It was proven to help improve motor impairment as mentioned in a 2011 study published by the American Stroke Association found. In the 2011 study found that 11 out of 12 studies previous studies showed a significant benefit from rehabilitation with virtual reality. Another benefit of using Virtual reality therapy in patients post stroke is being able to offer many different treatment options for each patient as no stroke survivor has the same impairment. Stroke physical therapy can be individualized to render the most effective treatment which will optimize rehabilitation and help the patient get close to where they were physically and motor skill wise before suffering from a stroke. The virtual experience activates neurons and induces a therapeutic effect on the brain that may reduce pain and increases function. By viewing the movement of an effected body part without pain, the brain undergoes a corrective learning process. Immersive virtual environments can break the everyday link between where our senses tell us we are and where we are actually are and whom we are with. Furthermore, VR increased perception and cognition. People who have survived a stroke and are living with minor to severe functional limitations. Impairments such as loss of range of motion and movement disorganization creates a deficit in motor control that affect the person’s ability for independent living. Therapeutic interventions such as facilitation techniques, progressive strengthening, biofeedback, and electrical stimulation have been used to promote functional recovery, but outcome studies have yielded inconsistent results. Virtual reality environment is an enhancement to existing methods of retraining the patient in after a stroke. Virtual reality rehabilitation is a new and developing science with very well established clinical trials and clinical experience. At DNR with CAREN (Computer Assisted Rehabilitation Environment) we are the leaders of VR treatment in the New York area.